As each year goes by and technology evolves, consumer behavior does, too. And with a change in the preferences and behaviors of customers, a business must also change its modus operandi. What worked for you as a company just 2 years back, won’t work now. Sure, there are some timeless principles, but the form in which they are applied and leveraged continues to evolve as new and more engaging ways of conveying information emerge. And if you don’t adapt, your customer acquisition and retention rates might nosedive to their death. With an abundance of businesses on the internet, content is one of the things that will make you stand out from the crowd and allow audiences to connect to you. Nike is a true King when it comes to content. Although it sells sportswear, Nike will never upload an advert with a picture of the latest athletic wear and its price. The power of its marketing lies in the visuals and sentences that talk of women breaking stereotypes, men triumphing in spite of disability, children growing up to become heroes. In short- a plethora of empowering content that makes people want to buy Nike gear because they want to be that hero, that achiever, and the one who overcame the odds. Nike makes them believe through its content that if they #justdoit, they will be that person. Buying Nike shoes almost seems like a no-brainer then. Another winner at content is TED. 5 million people have subscribed to watching these 18-minute videos. If you have ever surfed YouTube, you would have watched or been suggested to watch one of these, too. Their secret? The fire-catching phrase ‘Ideas worth spreading’. The conferences they hold, the people they invite, the initiatives they launch (TEDx, TED Fellows) are all geared to ‘ideas worth spreading’. They simply want to make content that people love. Their audience feels it, loves it, and TED keeps rolling out more awesomeness. And hence, content is not just blog posts. Looking to the example that TED sets, anything that your company rolls out on and off the Internet counts as content. Your website copy? Content. Guest post on a high-traffic tech website? Content. BTS Instagram stories? Content. The videos of the conferences that you hold? It’s all content, and you simply cannot compromise on it. Quality is of paramount importance and people can detect it quite easily. Audiences do not want to be directly sold to even if they know that’s exactly what’s happening. According to the Economist Group’s report ‘Missing The Mark’ 71% of buyers/ readers were turned off by content that seemed like a sales pitch. Hence, when you are creating content, make sure to emphasize on quality. A repertoire of creative content that resonates with people will build a more loyal audience than any amount of paid ads will. ‘What gets measured, gets improved’ is not for self-improvement junkies only. Tracking is an essential practice for all businesses, and when it comes to your marketing campaigns, it is absolutely essential that you measure how much you invest and the returns you reap on those investments. Else, you might end up making the same mistakes whether it is 2009 or 2019. Hence, using data for increasingly personalized interaction and to provide top-notch customer care experiences is going to be a major marketing strategy in 2019. Data is going to help you answer critical questions like: how is your product performing? How are customers engaging with it? What are they responding well to? What are they not responding to at all? Getting answers to these questions will help you direct your future marketing efforts. 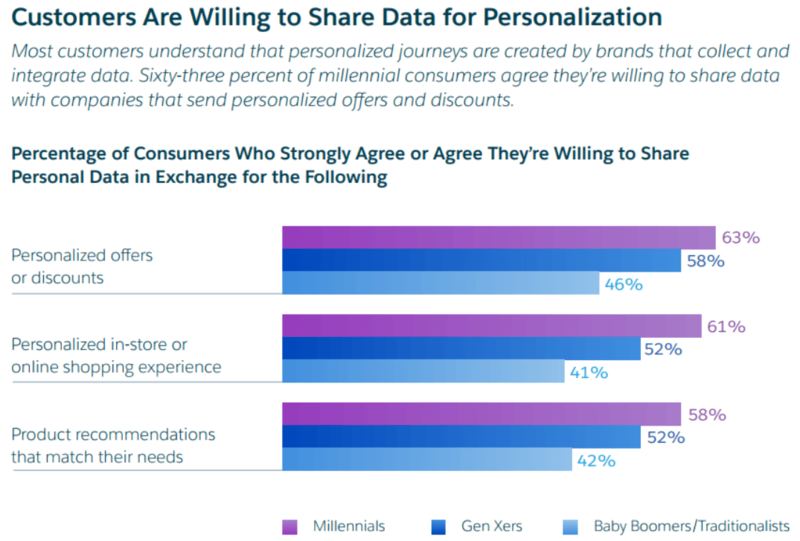 And notwithstanding common security concerns, consumers are willing to share their personal data if it means a better customer experience is the end result of it. Using data will also help you to segment your customers. Again, this will help you to make the right offers to them at the right time on the basis of profession, age, demographics, past purchasing history, and other insightful numbers. Stacy Martinet, VP of marketing strategy and communication at Adobe, told CMO.com: “A data-driven approach to creativity helps marketers work more productively, create the right content faster, and deliver that content to the right customer, across the right channels, at the right time”. No reason to not get involved in those numbers. According to Animoto, videos are consumers no. 1 favorite type of branded content on social media. If you embed a video on your landing page, it can drive up conversions by 80% or more. Numbers related to Facebook Stories and Facebook Watch, released by MarketingLand, reveal that 62% of people were more interested in a brand after watching a video about it whereas more than 50% of people said they make more online purchases as a result of Stories. LinkedIn is also on the way to becoming a marketing hub, especially for B2B enterprises. According to official stats, video is shared 20x more than any other type of content on the LinkedIn feed. On the other hand, if you are a B2C enterprise, Instagram stories might help you since 400 million people watch these Stories every day and 48% of consumers have made a purchasing decision after watching a brand’s video there. And how can we forget YouTube? The video giant has over a billion users which are 1/3rd of the internet population. These people watch more than 500 million hours of video on YouTube. The point that all these numbers are making? No matter which platform you use for sharing videos, rest assured that people are going to stop and watch it. But since it is also a form of content, you gotta remember- its quality is of paramount importance. Do not compromise on it, and you’ll have cracked a large part of the successful content marketing code. These 3 trends are primarily geared towards 2 objectives: forming a relationship with the customer and becoming a brand that they want to associate themselves with. Though not always quantitative, the results of these 2 objectives will make you an ace player of the long-run. What are you waiting for now? It’s time to call a meeting with your marketing team asap and discuss your strategy for 2019. The clock is ticking and your campaigns are waiting to be a success. What is CLV and Why it is the Most Important Metric for Your Startup? How to Hire Using LinkedIn through Free, Premium and Recruiter Subscription!